If you’ve ever miscarried or lost a baby, you might feel the expectation from the people around you to bounce back or move on. You might even place that expectation on yourself. Maybe “expectation” isn’t even the right word. It’s more like, life just continues on like normal with or without you being ready for it. As if your baby or your pregnancy wasn’t real or never happened. Like it was here and now it’s just….gone. Many moms don’t discuss it. Maybe you’re one that didn’t. You might not have even told anyone you were pregnant “just in case”. Maybe the rest of the world doesn’t even know what they don’t know. What’s important here is not the choices you’ve made to talk about it or not. No one knows what you need better than you. 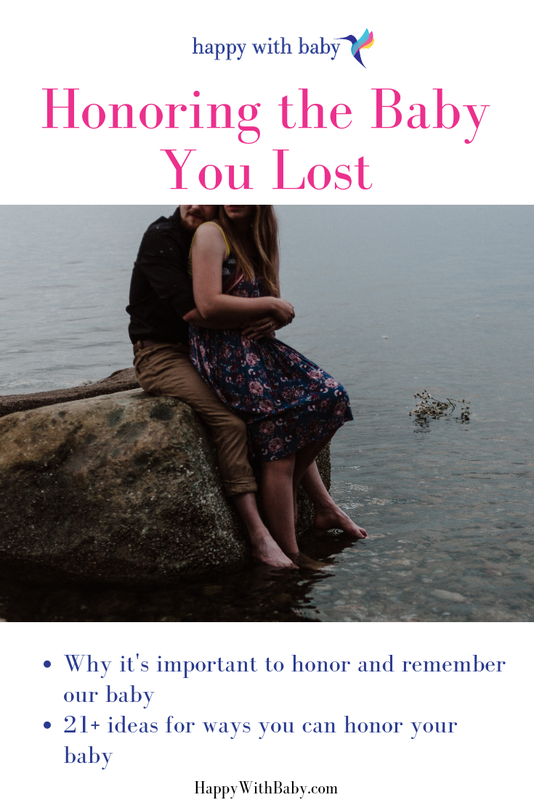 There is honor and wisdom and love backing up your decision to share or not share your pregnancy, your miscarriage, or the grief and loss you feel when you lose your baby too soon. But loss is kind of funny like that, isn’t it….the world continues on despite what happened to us or our baby and how we feel about it. And what I want to talk about today is slowing down so we can heal. How can we possibly slow down in a world that doesn’t stop? How do we slow down when no one even knows what’s up or what we need? There are many ways we can do that. One way I’m discussing today is finding ways to honor and remember your baby. Maybe you need catharsis or maybe you just need a way to connect with joy rather than sadness when you think of them. It might be something you do once and never again or it might become an annual tradition. Maybe it’s a very private, intimate thing or maybe it’s surrounded by your most important support people. Maybe it’s something you even do publicly with the intent of connecting with others to heal together. The point is, there are so many ways to do it and there’s no timeline for this. When you’re ready, I want to encourage you to find a way that feels good to you. Check out this week’s video and transcript below for 21 ideas for ways to honor and remember your baby. And if you need further support with this--whether it’s help with finding resources in your area or processing your grief together--please know that I am here to help. Happy Thursday. I can't believe it's already another Thursday and I can't believe that it's the end of October already. It's definitely fall-like here, which I do love the cooler days and really cold nights where you get to like put covers on and stuff and not be freezing. I even have a couple of friends that already had snow where they live, so--I've always lived in California so I don't really understand that concept of snow, which I'm not upset about. I do love the weather that we have. But anyways, to my point, so all month long, we have been talking about how we deal with grief. Particularly grief when it comes to losing a baby or a pregnancy too soon. The end of October is a time of year many start thinking about loved ones that we've lost. And I was just recently talking with a friend of mine and she was telling me about how her and her family celebrate Dia de los Muertos, or Day of the Dead, with their family. It really just got me thinking about how it is so important that we remember those and honor those that we've loved and lost. In a way, I think it can be especially true for those that have lost their babies because they love them so deeply and lost them way too soon. And you're not just grieving your child, but you're grieving all the potential and experiences that you didn't have. So it can be that much more devastating. But there's so much about this person that you never got to know, and I think for moms especially who knew the baby more intimately during their pregnancy, it's definitely more difficult because there's that deep connection. So, I think there's a lot to be said about healing and remembering and honoring those loved ones and so that's what I want to talk about today. What are ways that you can honor and remember your baby that you've lost too soon or other loved ones? You can ask other people to do it too. Sometimes people can hesitate or are fearful of upsetting someone, so they don't want to say anything, right. I talked about that before. But, if you talk about your baby and you talk about the things and then you can make people a bit more comfortable. It encourages them to start doing it too. Or if you're someone who is wanting to be supportive to someone else that is experiencing loss, then definitely don't be afraid to initiate it, the conversation and use the baby's name. And even if you want to say like, "Is it OK? ", most likely they're going to say yes, it's OK. You know, you can check in with them if you need to. Create a ritual or ceremony. And I'm not talking something like elaborate or even necessarily religious. It just can be something that you do maybe only one time or it can be something you do every year on the due date or every day sometime during that month to remember them, to just help you grieve and heal. It could be something as simple as sending your partner a text message, a special text message. It could be singing a song that makes you remember them or playing a song and maybe dancing with your partner. You could take a walk, maybe a walk in nature can be really healing. Maybe you light a candle that you set out all day and let burn all day. Maybe you plant a tree in their memory or you plant flowers. Or someone was even recently telling me that they plant a garden every year in memory of their loved one. And maybe the flowers are the flowers of the birth month or the month that you lost them in memory, whatever the flower is of the month. Maybe also just put some of their things on display or a picture or some memento maybe someone gives you in their memory. I have a good friend that lost their child and they still make a birthday cake every year on her birthday and have a celebration with their kids and everything. It's really quite sweet and I think it can bring a lot--it adds good memories to that date. Make a memory that lasts forever. Maybe you paint a picture of them or maybe you make a piece of art with their name on it and put it in your home. Maybe you get a tattoo honoring their birthday or honoring your baby. Maybe you have a piece of custom jewelry made with their name on it or their initials or maybe with the ultrasound photo or whatever, like something in memory of them. Maybe you write a letter every year and you put it in a special vase. Maybe you start a blog in honor of them. Maybe you keep a journal. Anything like that. And you can just tell them about what's going on or what you had hoped or it could be anything. You're just writing to your child or your loved one. Connect and heal with others. There's something to be said about being able to connect with people that have experienced similar losses. So, reach out to other moms that have done that. We--other parents--we need that support and we need to know, especially if they've been through it before us, that we need to know that there is love, there is hope after loss. So, definitely reach out to those that can connect and give you that support, that have a special understanding of the grief that you're going through. Or, maybe you volunteer or fundraise for a special event or a nonprofit that supports grieving moms or parents or a different cause. Maybe in memory of, or something that would be helpful in honor of them. Maybe you decide to run a 5k in their memory or you go for a solo trip or maybe you and your partner just go for a trip together. Maybe you write a song in their memory or, I think I mentioned it before, make a piece of art that you end up hanging in your home. Maybe you guys can do that together as a couple even. Or maybe you even decide to share your story publicly. Whatever you do, it doesn't matter how much time passes. Honoring, remembering a loved one a life-long, right. So, you can do it as long as it feels good to you and whatever you want to do. So maybe you do something different every year in their memory. So, I would love to hear ways you honor your loved ones. So please feel free to share in the comments because I think it's always helpful for others to hear what other people are doing to give them ideas or give them hope or give them, you know, some sense of peace. So, until next time, guys, take care.